Monday afternoon’s game against the Predators is probably one of those games where the team will briefly discuss (at some point), and then quickly move on and try to forget. The Capitals led 3-1 before yielding five unanswered goals for a deflating 6-3 loss on New Years Eve. Here’s a closer look at the statistics from the game. The Capitals are back in action this Thursday when they visit the Blues in St. Louis. Puck drop is set for 8:00 PM ET. 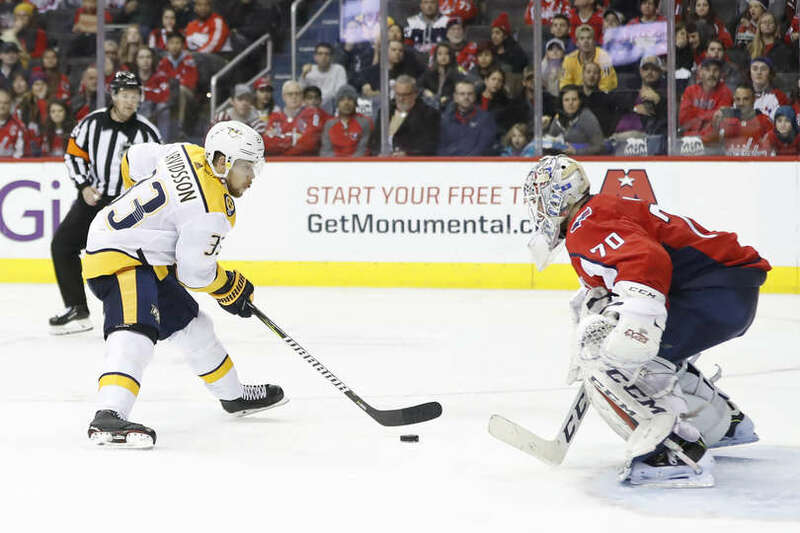 The Capitals jumped out to a quick 2-0 lead with goals from Michal Kempny and Jakub Vrana, before the Preds got in the scoreboard for a 2-1 score at the first break. The Caps would extend their lead to 3-1 before the Predators answered with three-straight goals to take 4-3 lead into the second intermission. The Predators would add two more tallies in the final frame for the 6-3 win. The Capitals ultimately yielded five unanswered goals after initially taking a 3-1 lead. Brooks Orpik made his first start since late October. Below were the starting lines and defensive pairs for the game. It should be noted that Reirden juggled lines midway through the game, and returning Wilson to the top line. The Capitals led in shot attempts 21-14 but trailed in shots on goal (SOG) 11-9 for the first 20 minutes. The second period was a period of shifting momentum. In the end, the Predators led in shot attempts 28-24 and SOG 15-10 in the middle frame. The Capitals led in shot attempts 19-11 but trailed in shots on goal 8-6 in the final frame. An interesting 5v5 Corsi graph for today’s game. The Capitals controlled the shot attempts and shots on goal for the first period, and led 2-1 after 20 minutes. The Preds stepped it up from the start of the second period, but the Capitals would stretch their lead to 3-1 during the Preds amplified period of shot attempts. The Preds would strike for two quick goals during a stretch where the Caps were out-attempting them. 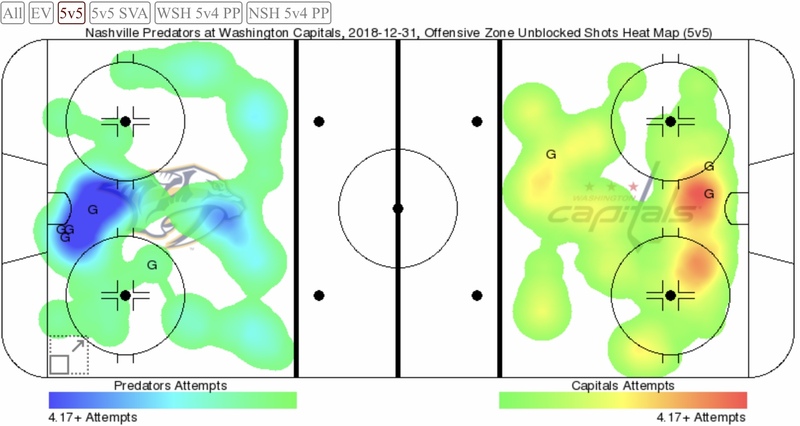 A high majority of the Predators goals came in the “high-danger” area, right in and around the front of the Capitals goal. On this occasion, the map is a good representation of the game. Braden Holtby stopped 28 of 34 shots faced for a .824 game save percentage. 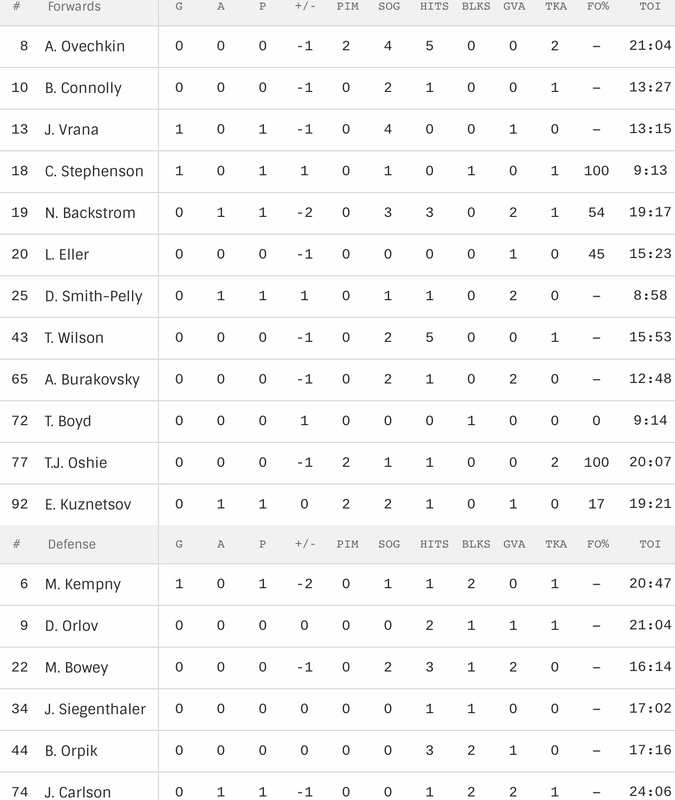 Pekke Rinne stopped 22 of 25 shots he faced, for a game save percentage of .880. The Predators were 1 for 3 on the man advantage. The silver lining, the one goal the Capitals penalty kill gave up was a result of a 5-on-3 man advantage for the Preds. The Capitals were 0 for 1 on the power play. The Predators won the faceoff battle 59-41%. Chandler Stephenson was 2 for 2, Nicklas Backstrom was 14 of 26, Lars Eller was 5 of 11, Travis Boyd was 0 for 6, T.J. Oshie was 1 for 1 and Evgeny Kuznetsov was 2 for 12. Nicklas Backstrom has passed Henrik Zetterberg (623) for the eighth most assists by a Swedish born player. Braden Holtby was given an assist on Stephenson’s goal, his second assist of the season. He’s tied for first in the NHL in assists among goaltenders. Chandler Stephenson gave the Caps a 3-1 lead with his second goal in his last three games and his third goal in his last five. Jakub Vrana scored his 12th goal of the season and now ranks second on the team in goals (Alex Ovechkin: 29). Evgeny Kuznetsov is now one point shy of 300 career points (87g, 212a). This entry was posted in News and tagged Chandler Stephenson, Jakub Vrana, Jon Sorensen, Michal Kempny, Nashville Predators, Washington Capitals. Bookmark the permalink.